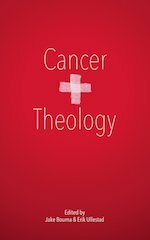 Cancer & Theology is an anthology of sixteen essays addressing the difficult questions of faith raised by illness and death. The essays, penned by a diverse collection of Christian thinkers, are often raw and always honest. Cancer & Theology provides unique insights about the presence of God and the importance of community in the midst of grief and uncertainty. A portion of all proceeds from the sale of this e-book will be donated to the Leukemia & Lymphoma Society. I commend the book to you – it’s only $5.99 and available for the Kindle here. Thanks Adam. For those who are e-book-averse, a print version is in the works as well, and should be available in the next month.